Sage Financials: What’s New in Sage Financials June 2018 Upgrade? As another month draws to a close, the latest Sage Financials (previously Sage Live) version is upon us. Version 83 brings the introduction of a Dimensions Wizard, Account Health Tiles, and further improvements to the transaction entry screen. The June release does differ slightly from the previous upgrades in that it will be a ‘pull’ upgrade. This basically means that rather than being automatically upgraded you can choose when you want to have the upgrade applied to your org. However, this will need to installed before the July release pushes through as normal in the first week of August! 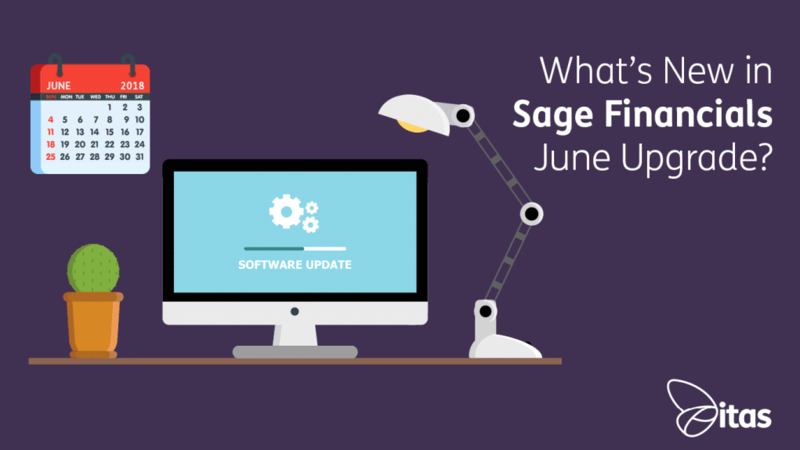 Here are our highlights from the the Sage Financials June Upgrade. First up is a new wizard that Sage have created to help guide you through creating dimensions and tags for reporting & analysis. The new wizard combines creating the dimension and tags, specifying a default tag per company and creating a new tab per dimension. This displays information about each tag. As well as this, it can also updates the relevant posting rules. It does this by adding a posting rule dimension to the posting rules based on the ledger accounts that you have specified in the wizard. This is a great tool that takes some of the complexity around the configuration of dimensions & tags away. Whilst viewing a Customer or Supplier account, you can now see how they are doing at a glance! There is now a new account health tile which you can find on the accounts page. The tile shows some really useful information on your accounts around key performance. When opening a record you can view the information on the right-hand side. Additionally, you can click-through and see a full health report, allowing you to easily drill down and see the detail of whats happening with an account. By default, Sage have picked some useful information to be displayed on the overview. However, you can edit the sections. Choosing which reports you want to show and even adding customised reports. Last month we saw the introduction of the Home Page in Sage Financials. This month Sage are introducing two new features to continue enhancing the Home page. The first feature, a Key Performance Indicator (KPI) section for Total Revenue, Available Cash and Total Expenses. The KPI sections will provide a summary of your businesses financial position. Clicking on any KPI tile leads you to a detailed report, where you can find a breakdown of the headline figure. The second feature is Financial reports. Within this section you will find a list of common financial reports for your businesses legislation. The report titles link to a detailed, full report allowing you to see a full breakdown of the information. A new ‘Unallocate’ option has been introduced in the June update, allowing you to reverse the allocation of customer receipts. You can unallocate multiple or single receipts from the Customers Receipts list. Additionally, you can unallocate single or multiple invoices from a receipt within a Customer Receipt. The transaction entry screens have been improved again in terms of layout. This includes the introduction of a Totals section, which shows the totals for the transactions in an easy to read grid. Each time the Items section is saved, the totals are updated. This therefore, replaces the old Values section. Within the Tax Breakdown, in line editing is now available. Therefore, you can click to change the Tax Amount. In the past, a separate Edit form was displayed. Please note, you must set the transaction type to allow tax to be amended. The new Sub-header section allows you to easily check out important information about your saved transactions. The transaction type determines what information is displayed in the sub-header. The Sage Business Cloud Migration Tool allows you to export data into Sage Financials from Sage 50c Accounts. Using the migration tool you can prepare your data for export, export your chart of accounts to a JSON file and review your company settings. Once ready, you can move the data across importing the JSON file directly into Sage Financials using the existing data migration import tool. In the May release, Sage introduced entering a default tag on transactions and journals. They have now extended this to include transaction items. June see’s a raft of new changes to the system, particularly in the detail of how the system functions. If you have any questions about the latest Sage Financials Upgrade get in touch with a member of our team. Home » Sage Blog » All Sage Blog Posts » Sage Financials: What’s New in Sage Financials June 2018 Upgrade?